The greatest benefit of this lower abdominal exercise is that it can be performed from any location with a flat surface. Lying on the back, fully extend the legs. The entire body should be parallel to the ground. Place arms above the head or off to the side for added stability. For yet additional support, place both hands palm-down in a diamond shape under the lower back. Slowly raise legs up (keeping them straight) until they are nearly perpendicular to the ground, exhaling throughout the movement. Slowly lower legs back down, inhaling throughout the movement. Do not allow the legs to touch the ground at the bottom (keep them 2-6 inches above the ground). Hold the lowered position for 1-2 seconds. 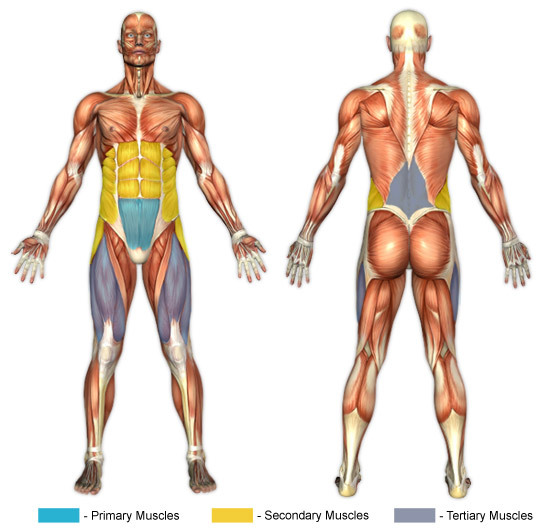 Placement of the arms behind the head or off to the side allows for complete focus of the abdominal muscles. This position can also help to prevent unnecessary back strain while providing greater balance. No matter the method, this exercise can put strain on the lower back region. It is recommended to stretch the lower back before and after this exercise. Arching of the back is a common problem that often arises in the down motion of this and similar exercises. If placing the arms directly behind the head to change the center of gravity doesn't help, try placing both hands palm-down in a diamond shape under the lower back. Additionally, one can slightly elevate the shoulders off the ground (about 1-2") to force the small of the back against the ground. This can greatly reduce stress placed upon the lumbar region of the spine.